In the recent post about 3 things that stabilize carbocations, I mentioned that carbocations are stabilized when their neighboring atoms donate electrons. This makes sense, right? Opposite charges attract, like charges repel. Well, this post is about the “like charges repel” part. 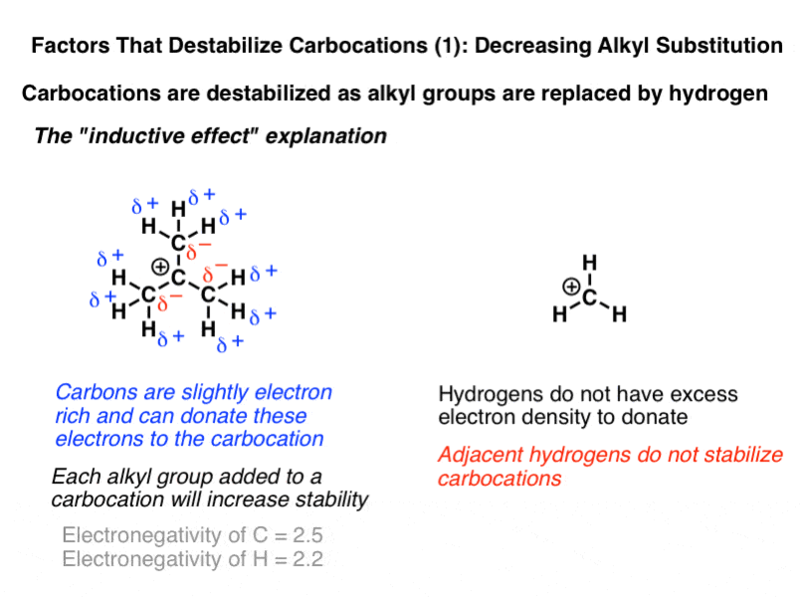 As you might be able to imagine, if electron-donating neighbors are stabilizing for carbocations, electron-withdrawing neighbors must be destabilizing. There’s at least three topics worth mentioning here – 1) replacing alkyl groups with H 2) electron-withdrawing neighbors, and 3) the effect of hybridization. 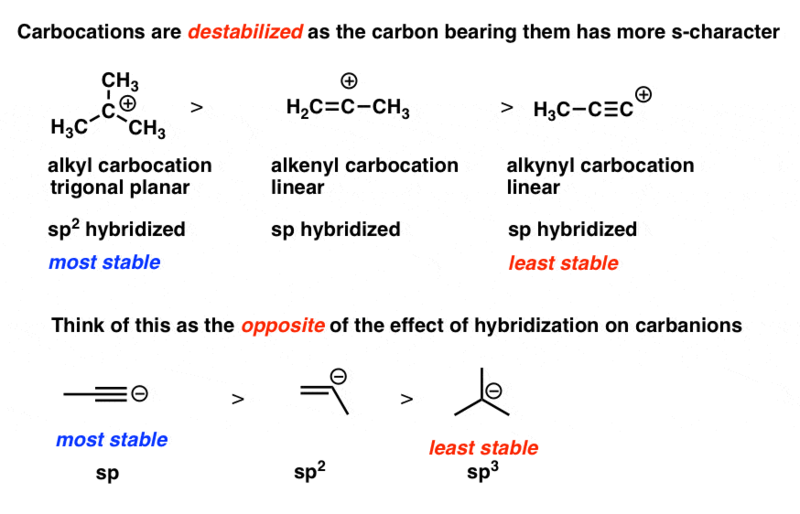 If carbocations are stabilized as we increase the number of attached carbons, they are likewise destabilized as we replace these carbons by hydrogen. There’s two traditional ways to explain this. 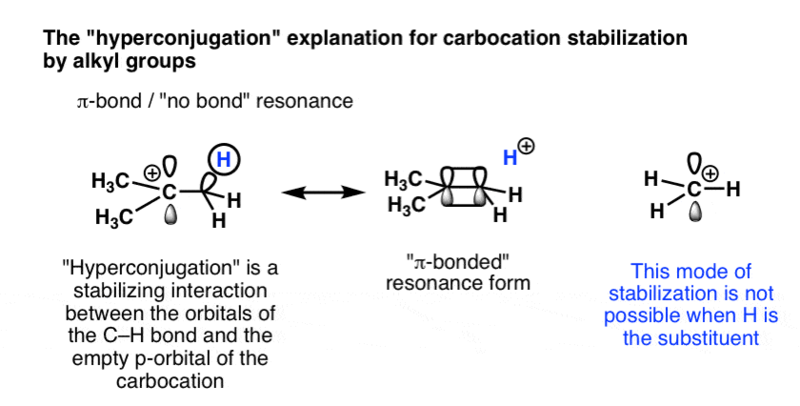 The simple explanation invokes inductive effects as the major contributor to stabilizing carbocations. Hydrogens have a mere two electrons in their valence shell – unlike carbon, they cannot withdraw electron density from neighboring atoms and donate it to the carbocation. The second, more theoretically robust explanation is hyperconjugation – the donation of electrons from a sigma bond (the C-H bond in this case) to the empty p-orbital. This is a more powerful concept, but many introductory courses don’t cover it. 2. Neighboring electron withdrawing groups (without lone pairs). The best way to explain this is simply through pictures. Check out these functional groups. If you look closely in each case you should notice the positive charge of the carbocation adjacent to either a full or partial positive charge on a neighboring substituents. This is true whether the neighbor is a group like CF3 or for aldehydes, nitro groups, sulfones, or many other groups containing atoms more electronegative than carbon. 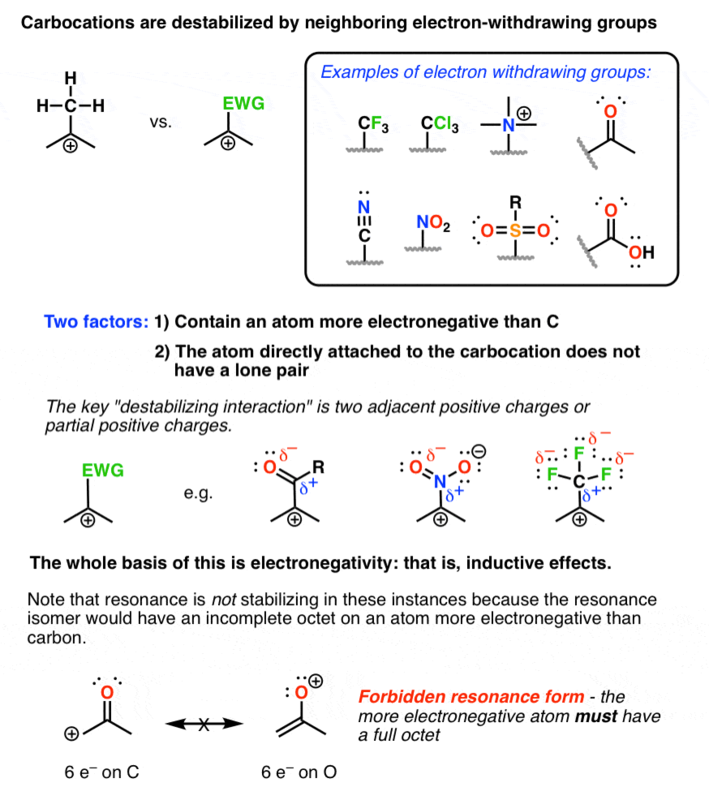 The first to note with all of these electron withdrawing groups is that none of the groups contain an atom with a lone pair directly bonded to the carbocation. This is important! Most people would consider halogens such as F, Cl, Br, and I to be electron withdrawing groups due to their electronegativity, but in fact all of these groups help to stabilize positive charges. Why? Because each of these atoms have lone pairs which can be donated to the carbocation, which is a stabilizing interaction. The second thing to note is that resonance, while possible, is not stabilizing in the case of groups such as aldehydes, ketones, and other groups with multiple bonds to electronegative atoms. The reason is that these resonance forms are really unstable – if you take the time to draw them out, you’ll see that you end up with a resonance form with the more electronegative atom lacking a full octet. That’s just not going to happen. 3. Hybridization. The trend here is pretty simple: the stability of a carbocation decreases as you go from sp3 to sp2 to sp. You don’t see carbocations on double bonds very much, and here’s a good reason: compared to sp3, there is more s character in the orbitals, so the empty orbital is held more closely to the nucleus. This is destabilizing if we’re talking about positive charge. If this sounds somewhat familiar, it should – it’s the exact opposite of the argument for why negative charges are more stable on sp hybridized carbons as opposed to sp2 and sp3. Remember the factors governing acidity? Well, all the factors there are pretty much a roadmap for things that stabilize negative charge. This whole post is talking about destabilizing positive charge. All of the trends that increase acidity will decrease the stability of cations. Cool how it can all connect, huh? you said here that “Most people would consider halogens such as F, Cl, Br, and I to be electron withdrawing groups due to their electronegativity…” but then cited CF3 as an electron withdrawing group. Is this a mistake? Did you maybe mean to cite the other halogens but leave fluor out? If you look at F, Cl, Br, and I, they each have attached lone pairs. So while they do indeed “pull” electron density away via electronegativity, they also “push” electrons towards the carbocation through donation of a lone pair (forming a pi bond). This “donation” happens to outweigh the effect of electronegativity in the case of the halogens. CF3 is a pure EWG because there is no lone pair on the carbon to donate into the carbocation. 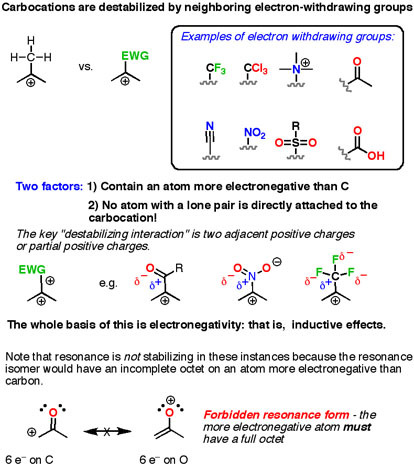 By the same token, CCl3, CBr3, and even CI3 could be counted as electron withdrawing groups.